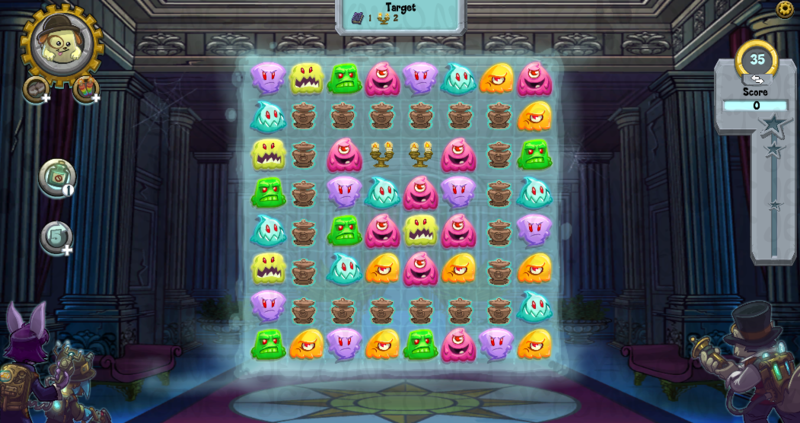 Ghoul Catchers is a "match-three" game that is very similar to Sutek's Tomb and Goparokko, but with a spooky twist! Ghosts have escaped from Haunted Woods and released into the world. You will be driving ghouly ghosts away from houses throughout different Lands of Neopia. Sound fun? Then, get ready for a ghost expedition! I'll be brave... let's banish some ghosts! In Ghoul Catchers, the goal is to strategically clear ghouls and achieve the required 'Target' points and tasks before you run out of moves for each level. Use your mouse or touch screen to match three or more ghouls to destroy. The beginning levels start off easy to complete and earn Neopoints, but the level difficulty will increase as you progress through each map. When you first start the game, you will be presented with the Brightvale map, which has 20 levels to complete. Each level is a haunted house, and you will progress from house to house on the map. If a house is available, you can replay it as many times as you want to earn points (50,000 NP daily maximum) and to improve your star points if needed. If you've reached the 50,000 NP daily max, you will still be able to repeat or play new levels, but you won't receive any more Neopoints for that day. The heart represents your life meter, which is "full" at 5 lives. If you lose a life (or all 5), you can wait for each life to recharge (20 minutes each), ask for extra lives from friends on Facebook, or purchase some for $0.99 each. You can lose a life when you fail to complete level requirements, restart a level or go back to the map while playing a game. The gold star represents your level, score, and Achievement progress. It's important to collect enough stars so you can continue on to the next map, or else you will have to pay real money to unlock it. Each house has three stars you can fill. As you earn points from destroying ghouls, your star meter will increase. If you reach the top of the star meter on the Brightvale and Faerieland maps, you will receive three stars when the level is complete. Otherwise, you will receive a star based on where the meter stopped. Maps after Faerieland, will allow you to keep the stars you earned in the game without having to win the level. The envelope will display your friend's list and allow you to send extra lives to them. When you click house 1, you will be brought to the actual game screen shown below. There will be different colored ghouls stacked in rows and columns. Tap on a ghoul and swipe it to move. 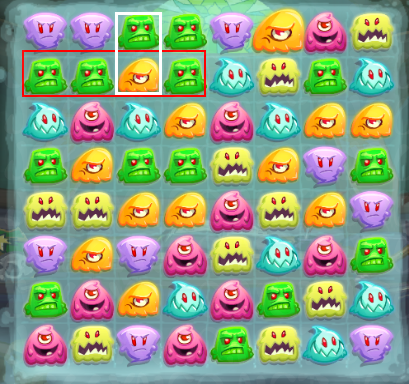 Matching 3+ ghouls of the same color will vanish, and more random ghouls will drop on the top row. The game will not allow you to swipe unmatched ghouls, unless you are matching 3+ ghouls or have purchased a Tailchaser power-up ($0.99). Some levels will require you to complete a tutorial before you can continue playing the game. The 'Target' is the required number of points you need to earn. The number in the golden circle are the available moves to complete the 'Target' score. When your moves are at zero and the score is achieved, the house will be banished of spirits and you can continue to the next level. Extra points earned will benefit to your star meter. The Warf petpet will provide the option to use the Tailchaser and Prismatic Sparkler power-ups when available for specified levels. If you run out of moves and didn't complete the required 'Target' score, you will be given an option to 'Flee' and repeat the level later or purchase more moves ($0.99). If you choose to 'Flee', you will lose a life. If you still have available moves and there aren't any matching combinations, the board will automatically reshuffle to help you. 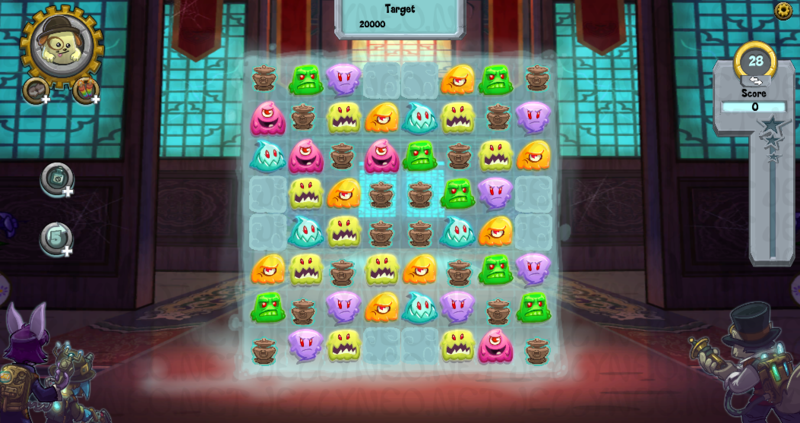 Combining special tiles will earn you extra ghost vanquishing power! When your moves reach zero, any unused special tiles will automatically activate and earn you extra points! After you've completed a level, you can repeat it or move onto the next. The haunted houses in Faerieland requires extra tasks to banish ghosts for specified levels. When available, the 'Target' will display the number of item(s) you need to deliver. You will need to match ghouls to make room for each item to reach the bottom. When the items reach the bottom, they will disappear and be delivered. The game will allow you to swap items with ghouls, as long as you are creating 3+ ghoul combinations. Once all item(s) are delivered, the 'Target' will update with the score you need to achieve with the available moves you have left. For levels that require you to deliver items - If you have any available moves left after completing all level requirements, the game will automatically count down your moves and activate random Spectral Shackles and Ghost Traps for each remaining move. This is an extra game perk to help you achieve more stars. This map also introduces a Cyodrake petpet to join you in the haunted house. This petpet will give the option to use the Fire Ball and Spit Fire power-ups. Some levels will provide an option to choose between the Warf or Cyodrake. The haunted houses in Terror Mountain introduces the 'urn' barriers to destroy in every level. You will need to make matches with ghouls so the 'urns' will get crushed from ghouls dropping on top of them. The 'urns' cannot be swapped with ghouls or items - they will stay in place until they are destroyed. To win the level, you will need to complete the required 'Target' points and deliver items for specified levels. This map also introduces a Neucloop petpet to join in the haunted house. This petpet will give the option to use the Block Buster and Ink Splash power-ups. You will also have the option to choose between the Warf and Cyodrake petpets when available. The Lost Desert haunted houses requires you to eliminate the "plagued ghouls". 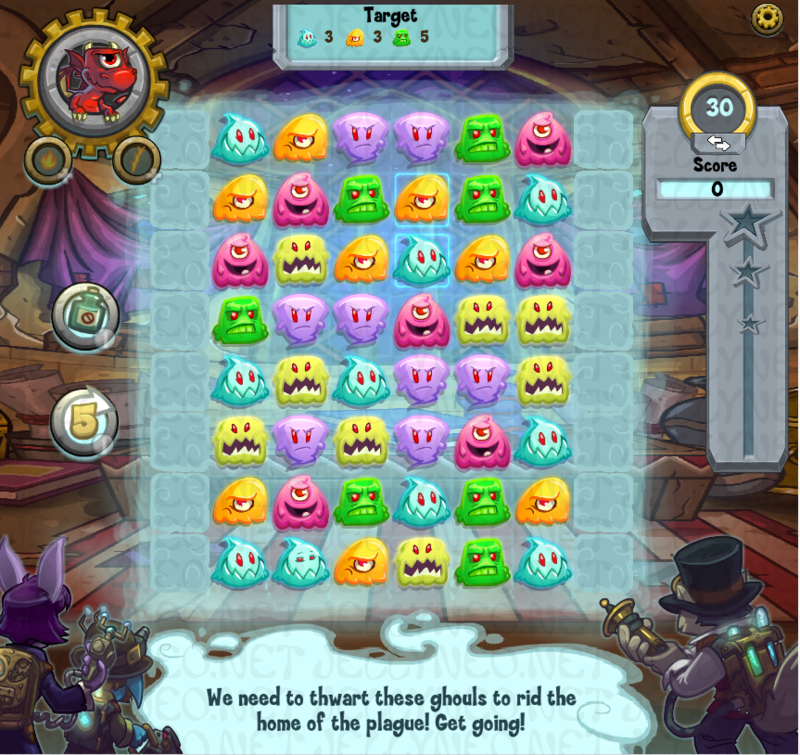 The 'Target' box will show a specific number of colored ghouls to eliminate for certain levels. You also need to complete the in-game 'Target' points, along with delivering items when available. There will also be 'urns' to destroy for certain levels. To complete the level, all 'Target' requirements must be met. For levels that require you to deliver items or eliminate the "Plagued Ghouls" - If you have any available moves left after completing all level requirements, the game will automatically count down your moves and activate random Spectral Shackles and Ghost Traps for each remaining move. This is an extra game perk to help you achieve more stars. You will also have the option to choose between the Warf, Cyodrake, and Neucloop petpets for specified levels. The Shenkuu haunted houses requires you to complete the 'Target' point requirements, along with delivering items, and eliminating the "plagued ghouls" when available. There will also be stacks of 'urns' in various formations to destroy for certain levels. Some level layouts have a lot of block barriers, which makes it more difficult to create ghoul combinations. The Altador Haunted Houses aren't too different from the Shenkuu houses, except levels will have more challenging layouts and requirements. You will need to complete the required 'Target' points for each level, along with delivering items and eliminating "plagued ghouls" for specified levels. There will also be stacks of 'urns' to destroy and block barriers for certain levels. Spectral Shackle Match 4 ghouls to create this special tile. It will eliminate a complete column or row, along with any matching ghouls attached. Each ghoul zapped is worth 100 points each. 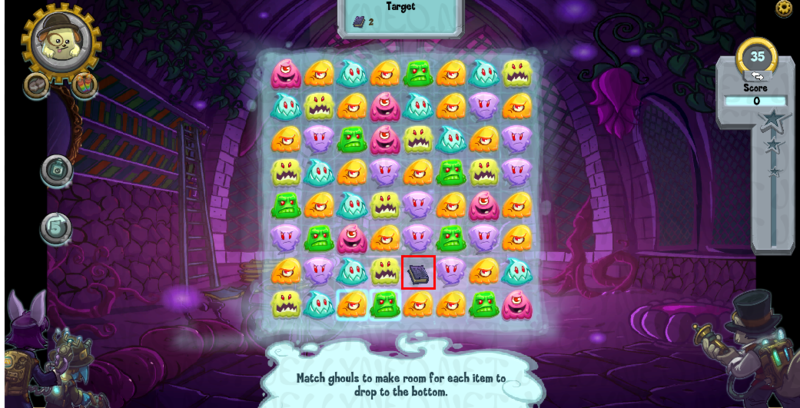 Ghost Trap Match up five ghouls in an L, or T shape to create a handy Ghost Trap. 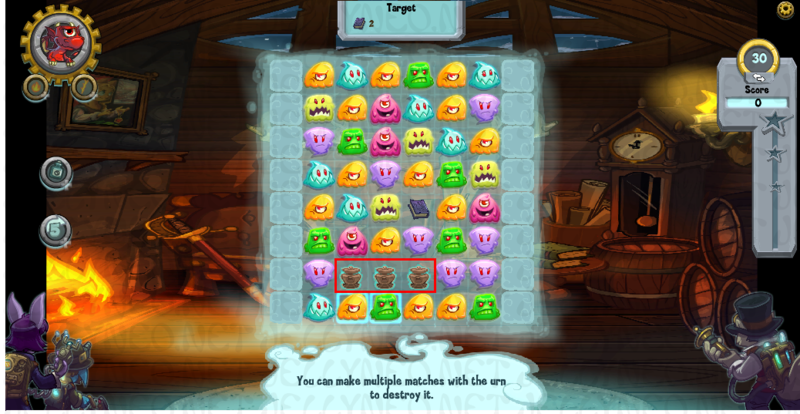 Match the trap with a ghoul of the same color to vaporize a 3x3 grid of ghouls around it. Each ghoul zapped is worth 200 points each. Glyph of Banishment Match five ghouls in a straight row or column. You can swap this power-up with any ghoul, and it will eliminate every ghoul of the same color that was swapped. Each ghoul zapped is worth 300 points each. Swapping two Spectral Shackles will eliminate one row and one column. Each ghoul zapped is worth 100 points. Swapping two Ghost Traps will eliminate a 4x3 grid around both Ghost Traps. Each ghoul zapped is worth 200 points. Swapping two Glyph of Banishment tiles will eliminate every ghoul on the board. Each ghoul zapped is worth 300 points. Swapping a Spectral Shackle and Glyph of Banishment will create and activate Spectral Shackles with every colored ghoul as the Spectral Shackle. Swapping a Glyph of Banishment and Ghost Trap will create and activate Ghost Traps with every colored ghoul as the Ghost Trap. Swapping a Ghost Trap and Spectral Shackle will eliminate three columns and three rows. 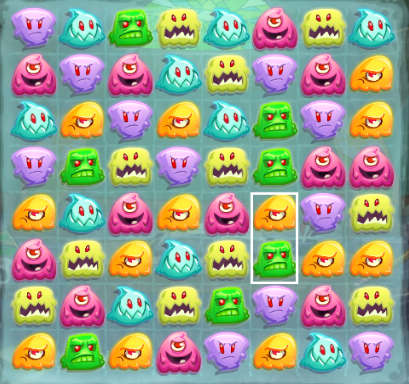 When a level begins, concentrate on areas where you see a lot of the same colored ghouls and check if you can connect 4+ ghouls to create a special tile. 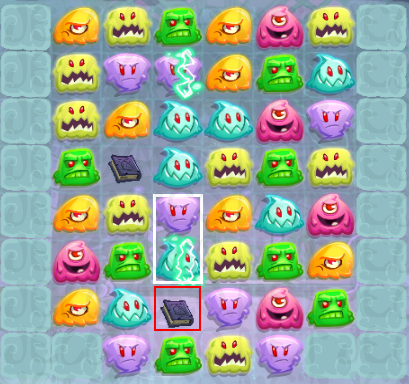 Whenever possible, swap special tiles with each other - more ghouls will clear and earn you points faster! In the example below, the best move is to swap the orange and green ghouls outlined in white. This will create a Spectral Shackle when the 4 green ghouls eliminate. The tile can then be used when matching 3+ ghouls or used to combine with another special tile. If a special tile is never used, it will still benefit you extra points at the end of a level. 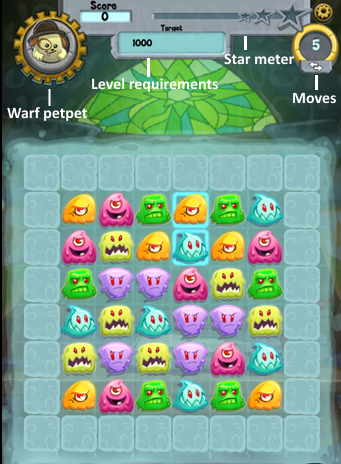 If you don't see any options to create special tiles, try to eliminate two sets of 3+ ghoul combos at once. This will not add any extra points, but it will save your moves and possibly create more combinations. 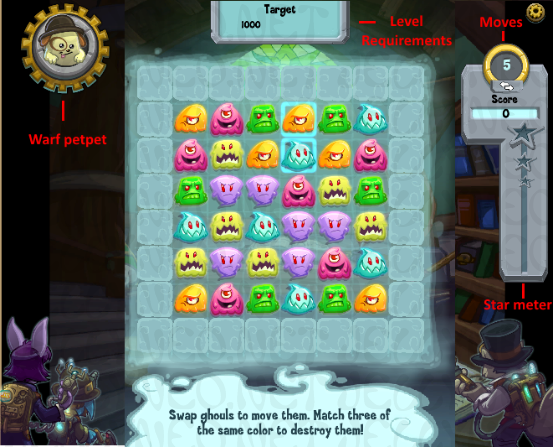 In the example below, swapping the ghouls outlined in white will eliminate both green and orange combinations at once. Try to keep the 'Target' items in the center of the board when creating combinations. This will prevent them from getting trapped along the sides or in a corner. An easier way to deliver the items is to activate a special tile on the same row or column, so the item(s) will completely drop to the bottom. In the example below, swapping the purple ghoul will activate the blue Spectral Shackle and eliminate the entire column. The item beneath will drop to the bottom and be delivered. Before swapping any ghouls, check to see if you can eliminate 4+ to create a special tile. Swapping two Glyph of Banishments will create the best special tile combination! Every ghoul on the board will zap for 300 points each (Thanks to Maivry for this tip!). If you fail a level, try repeating it again before you resort to spending real money. You might have better luck the next time! Repeating level 1 will earn you an easy 1000 Neopoints, since the point requirements for 3 stars is low. Try not to move items to the sides and corners as it will make it more difficult to deliver them. Clear ghouls in the middle of the board if you can until they drop. This page was last updated on April 14, 2019. Let us know what you're looking for so we can plan updates or point you in the right direction. What were you looking for on this guide? Human Proof: What species of Neopet is this?